I haven't picked any fabrics yet. I don't have any idea what I am going to do. But.....I am ready!! We've received an overwhelming response for this next round so we're a little backlogged. Many apologies for the delay, but you should be receiving your blogger invites today. Thanks for being so patient! It won't be finished by the deadline, that's for sure. Here's my first quilt. I had been searching for a wall hanging that would match my living room decor but to no avail. So I had to go and make this wall hanging quilt. I'll post the pics after the binding has been attached and hung. I'll post my second quilt in a few days. Yes, I am feeling just a bit guilty because even though my top is unfinished, I am going to participate in the quilting sew a long. It has been a busy summer so far and I can't believe the time went by and I didn't finish. Anyway, our holidays are almost over and things should settle down soon so that I can not only finish my top, and get some use out of it this summer, but also the next project. I was at the library yesterday and found a book called The Crazy Quilt Handbook by Judith Montano. It has great instructions and several small projects which seem quite manageable, so I am hoping to complete either a needle case or a small bag of some sort. There is a small heart shaped bag and an evening type clutch to choose from. We leave tonight for the last week of holidays and I will take the book with me so that when we return, I will have made a final decision and be ready to tackle it. I am looking forward to it and also seeing everyone else's projects!! Yes, I know I am late...but I also moved in July. And only found out I was moving 3 weeks ahead of time. It's just a basic, stretch knit mock turtleneck with half-length sleeves. 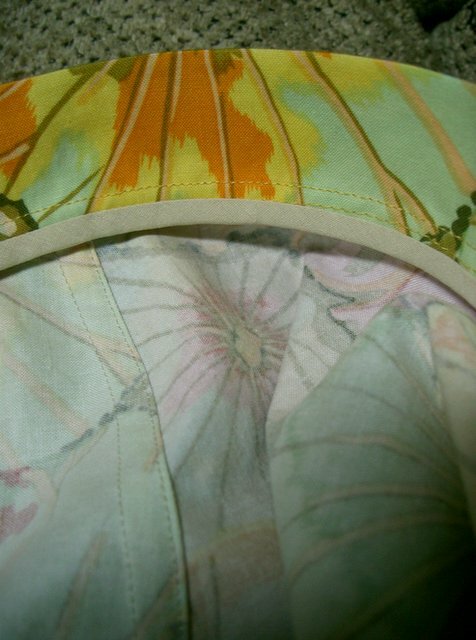 I plan on using fusible bias tape to hem it. Has anyone used that before? With this fabric the hem is just too noticeable I find if I try and sew it. For quilting I will be making an "any way you slice it" quilt top to use as a duvet cover. Better get crackin soon! Is it against the rules to start early? I just started working on these little ornaments yesterday and they are all ready to assemble. There is lots of chain piecing in my immediate future, but hey it's too hot to go outside right? 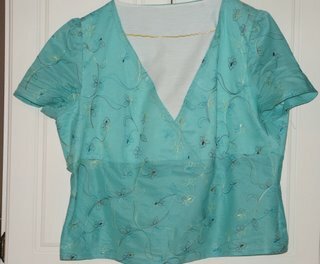 I too am a bit late in posting but i just had to share my top - it's the first top i've made for myself 'from scratch!' And it fits! I made most of it before July 15, but then 'life got in the way' (work deadline, my celebration aka wedding, good summer weather). But now that two of the 3 are done, i finished this top today. 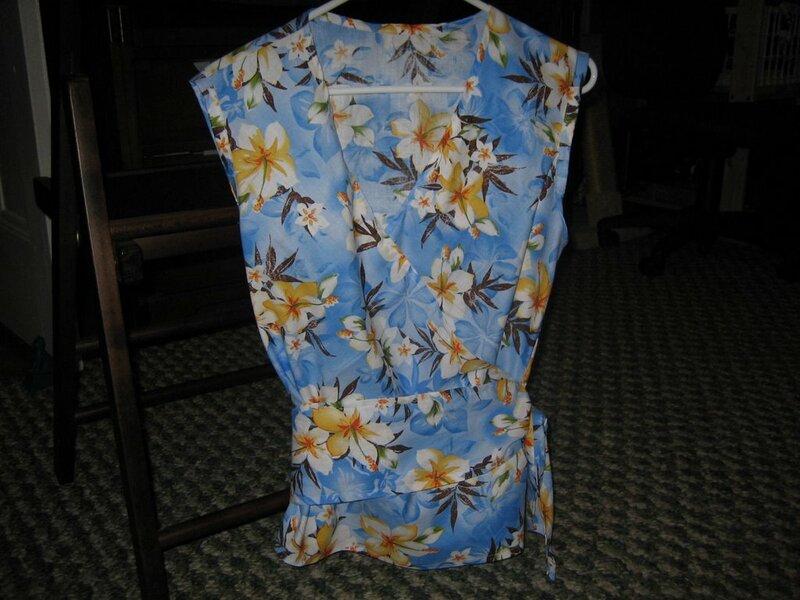 I made it from a Simplicity pattern, and other than the collar, it really was simple. I used black eyelet fabric, vintage flower buttons, and i made the bow separate so that it can be either around the collar or the waste - which is the way i like it today. I can't believe the next theme is quilting because i have a quilt that's waiting to be finished (well, actually started even) so this will be my inspiration! 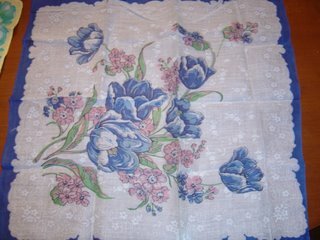 I have been collecting vintage hankies and have finally got just about enough to start the quilt/bed cover. This will be my next big project. 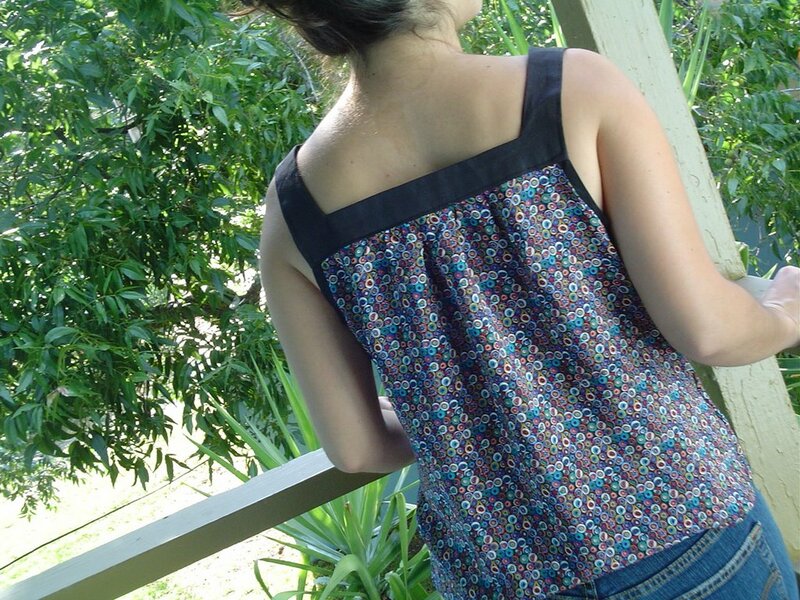 I know I've missed the dealine for the top sew along, but I finally finished something! Fabric: I think it was from Spotlight, so long ago. but 2 hours to finsh from the first photo to complete. 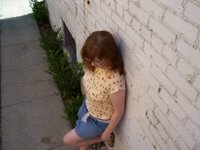 Things I'd do different: Longer in the bodice and choose different sleeves, a combination of the length of view B and the sleeves of view C.
It's funny, because for all this time the facings were giving me grief, and the minute I put it on the form it all fell into place, it just clicked. WOW, see magic! By the way, any suggestions for a name for the dressmakers form? 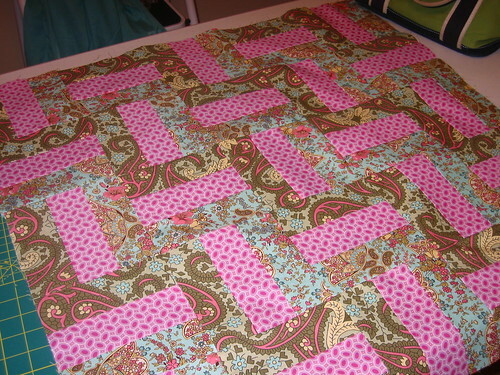 For this round I'm hoping to get this quilt done, which I've had for a bit in kit form. I think it's just the right size for the time frame, so hopefully no more late posting! I sat out the last SIK because I'm not really into sewing clothing so I was anxiously awaiting the announcement of the next one. 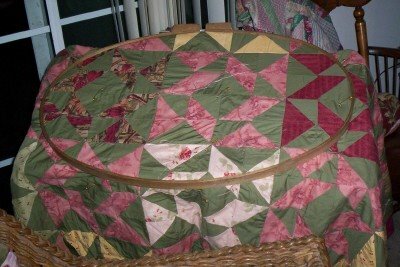 How excited was I when the challenge is quilting? For the past two weeks I have taken a beginning quilting class and have a nearly completed quilt top. All it needs are the two borders. I won't be quilting it until the 10th, when I take another class. 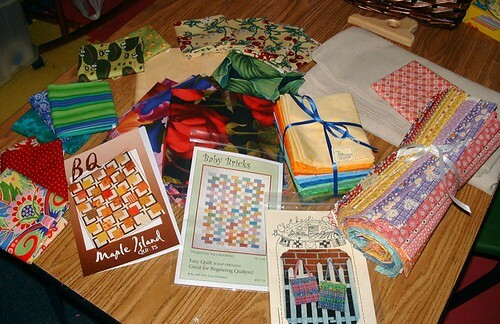 This is what I have purchased this week from two local quilt shops. 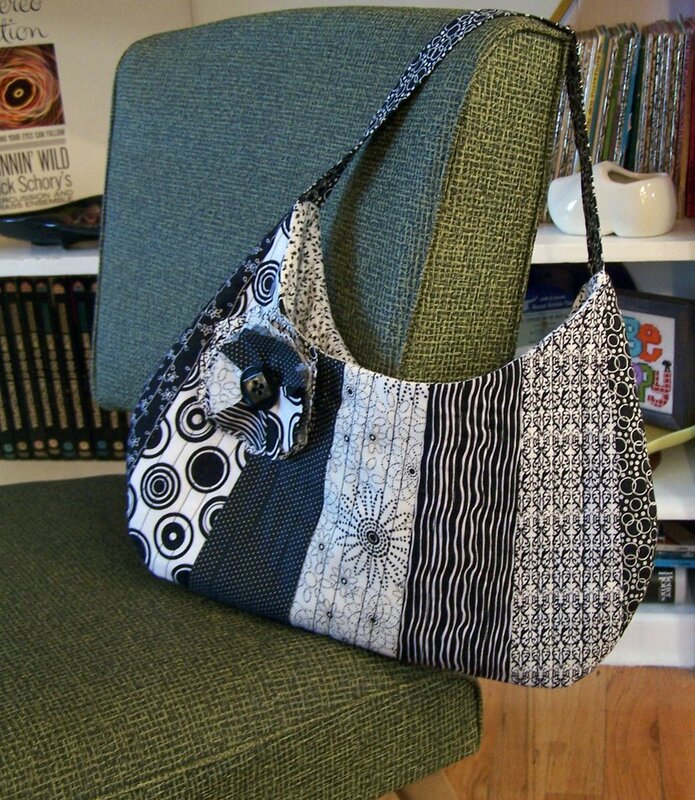 The floral kit on the left with the BQ pattern and the crayon bag pattern are definitely for this challenge. 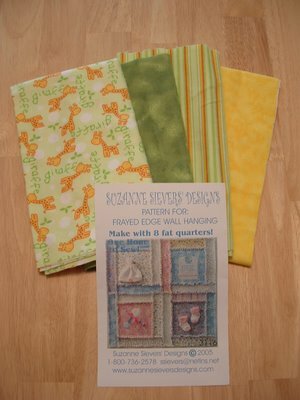 The fat quarters will become quilted bags - hopefully before the deadline as well. Thanks for such a fun group! After sitting the last project out I am so excited to start this next project. I love quilting and this year I have been trying out little projects to develop my confidence.I have three projects in mind if there is time. The first is to make a tied picnic quilt for my neice (4 yrs)- with pink floral fabric patched with plain shades of pinks embroidered with cakes, hearts and butterflies. The second project is to complete the above which will be a wall hanging made up of 4 pieces of fabric A4 size with the spotty border. 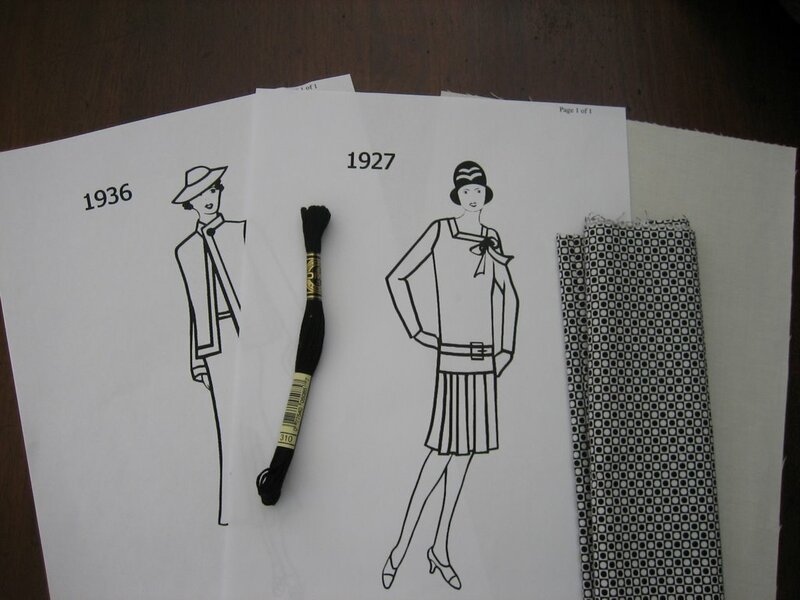 Blackwork embroidery with images of different styles of dress from the 1920's onwards. I found the most amazing website www.fashion-era.com with these beautifully designed women.Pauline has very kindly given me permission to reproduce her images for my quilt, full of history and lovely images it is an enchanting site. The last project is to start our wedding quilt - 3 years late but hey, a wall hanging. A dear friend brought squares of calico for each of our tables at the reception and got everyone to sign their names. The idea is to embroider their names and then piece it simply and sew. I may not finish it in time but it would be wonderful to start an overwhelming but exciting project of preserving special memories. Will keep you posted when I start the others. It is fun to think of us all starting another project together. BTW after writing about my struggles with my skirt and promising myself to get zip tuition - I did and haven't been able to stop making skirts for the summer - I am so grateful for this sew along. The most inspiring way so far to motivate me and to get some confidence growing. I can't thank you all enough. I was delighted to see quilting for the next project, as I need to get moving on the project here. 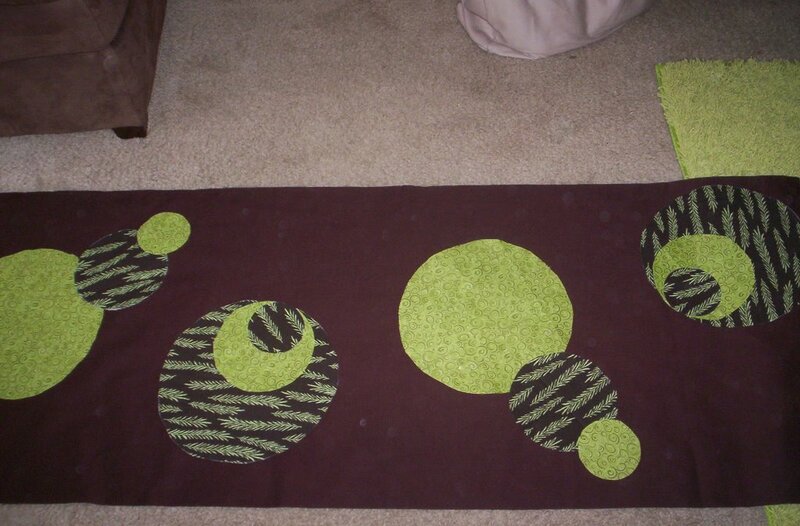 My daughter's girlfriend is having a baby in August, and I want to make the quilted wall hanging sometime in the reasonable future. The pattern is by Suzanne Sievers Designs, and I got it from the Creative Quilting catalog..I'm sure you could find it either place if you're interested. I was going for blues, but found this nice bright assortment instead. It's a "rag" quilt, so it should go quickly. I hope. It uses a real pair of socks, rattle, bib and hat to decorate each block. I'm not sure if I'm early but here are some quilted things I've worked on recently. I have a few more project ideas to work on. I can't wait to see what you guys come up with. At least it's still morning here in Atlanta (and HOT!). 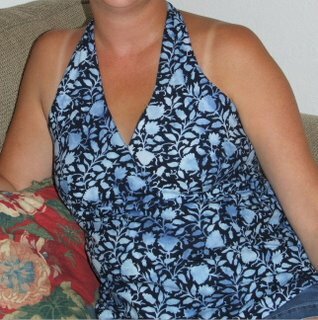 Hi I'm Amy, otherwise known as AmyDe and I have just joined this group. I've followed it for a while, but time/life (isn't that a magazine?) didn't allow. I am glad to be here and looking forward to the quilting projects. 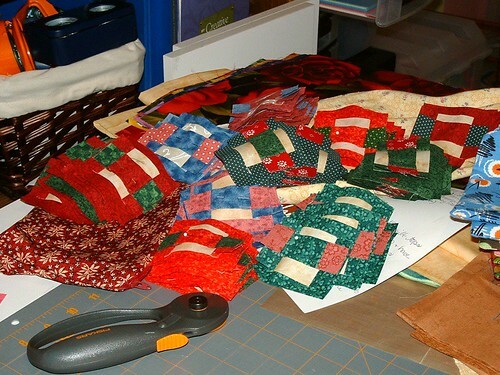 I have at least one quilt to complete and a couple of quilted bags - fun stuff. I am excited about getting to know some new folks and learning from all of you. I have been knitting for about 5 years and I started sewing about 20 years ago (gosh that makes me feel old) when I was about 13. I've done all sorts of crafts through the years, sewing, quilting, knitting, crochet, cross stitch, stamping, scrapbooking, etc. Now I stick mostly to sewing, knitting, and crocheting. I do scrapbook about once/month with girlfriends though. Hi, my name is Amanda. I've been kntting for about two years now and bought my sewing machine last Thanksgiving. It had not been put to a lot of work so I'm joining this sewalong to motivate me to finish something. 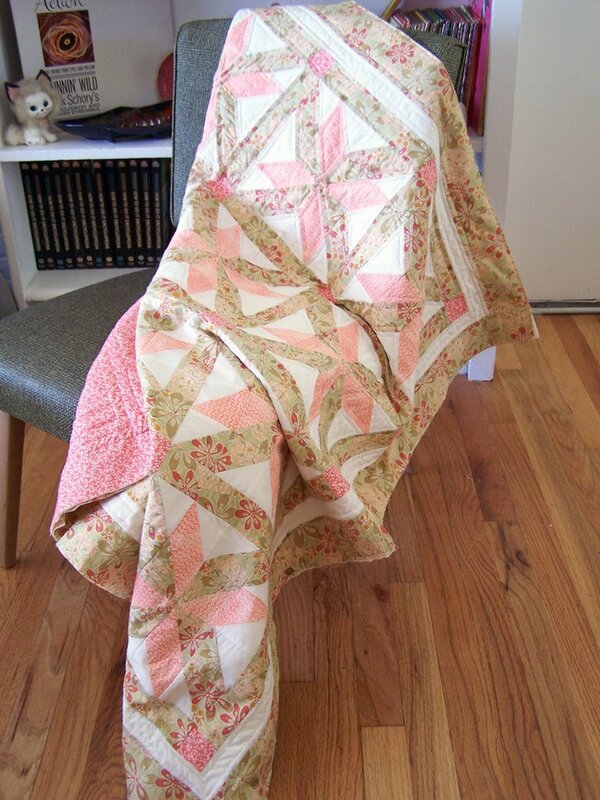 My plan is to make a baby quilt from Denyse Schmidt's book. I already have a colour palette in mind, just need to gather the fabrics. Check out my blog here. Looking forward to see all your quilts! Hi Ladies I would like to introduce myself. My name is Phyllis and I've been quilting since 2000 and the rest of my crafting grew from that. I knit, crochet, sew and quilt. Please feel free to check out my blog at http://knitgirlll06.blogspot.com I've been lurking here for some time now and was invited to join for the quilting project and I can't wait. i finished my top a while ago, but it's been sitting around waiting for me to rip it out because it was a disaster! a most unflattering photo is here, on Flickr. The pattern was New Look 6483. 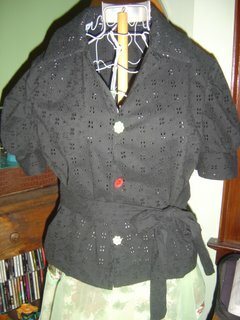 Basically, I messed up the darts and I hated the bulkiness of the interfacing. Not giving up, except maybe on this pattern. 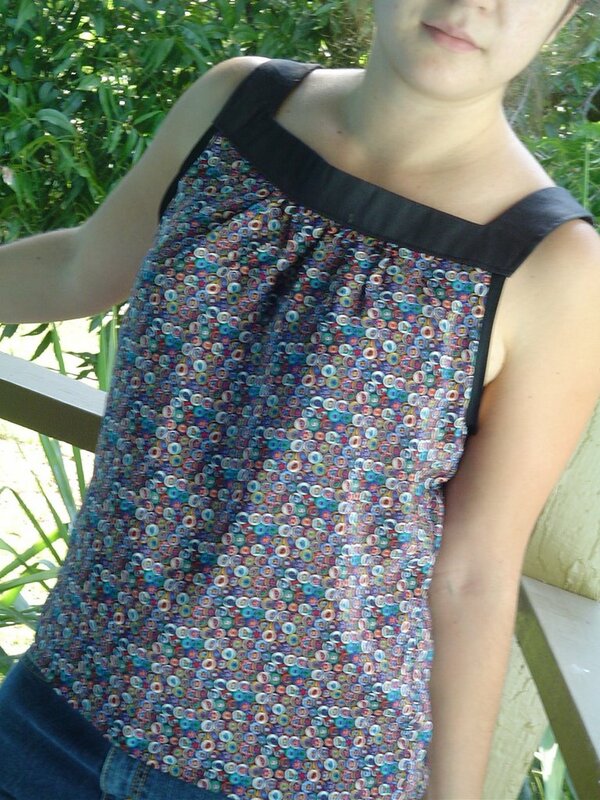 I'm going to try another top, from the current Burda Easy Fashion Magazine. You all have made some lovely stuff! I have had my project done for almost 2 weeks now, I just haven't had the time to come here and gab about it. But here I am now! I actually ended up making not one, not two, but THREE tops. I was fairly unsatisfied at how they kept turning out, so I guess I just kept making a new one, due to frustration. It was mainly 'fit' that was causing the grief. Top #1 was for my wee lass (Simplicity #4206). It turned out too short (I even added length to begin with! ), boxy, overall tent-like. Pretty unflattering. Here's another photo, but don't let it fool you. It looks okay, but we did some strategic modeling to make it look so. #2 I attempted for myself (New Look #6239). Just to sum it up, I made a much larger size than I should have, which equated to unwearable, ill-fitting even-larger-tent, in the end. I am hoping I will be able to adjust it. If not, I will rip it out, as it's such a waste of fabric. 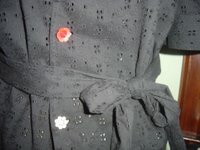 Very depressing, this one, as I was having such a joyful time sewing it up. I will have to try another top for myself in the future, just not anytime soon. The Third time's a charm, right?! So I made #3 for my daughter (again)...less fabric waste, you know, just in case. This one turned out fine (Simplicity #4610), thank goodness. I added an inch to the patterns' length, and rickrack trim to the bottom. It fits! What a complete relief! I apologize for the bombardment of visuals, but there's even more on my blog (& the "top" saga! ), fyi. I am so looking forward to the quilting project! I have so many ideas....and yippee...it need not 'fit' any one person....just perhaps a pillow form, or the back of a couch, or a baby's hand, etc... Love that! ;~) ). Glad to see I'm not the only one who finished yesterday under the wire and couldn't blog about it til today. 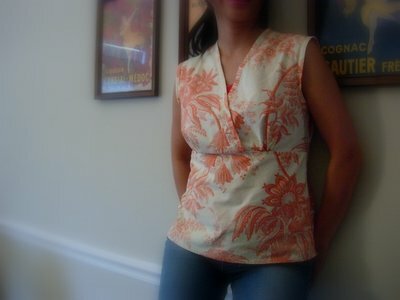 Here's my finished Burda 2561. 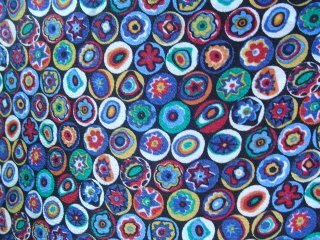 The fabric is a quilting cotton, I believe it's a Kaffe Fasset. For the photo, I had to choose between "arm cut off" and "blurry". You can see both on my blog, as well as a few pictures on how I changed the pattern from a regular shirt collar to the scoop neck with ruffle. I also cut the sleeves off to make cap sleeves. This was fun and so easy, I don't know why I waited til the last minute! For some reason, this past month has totally flown away from me! 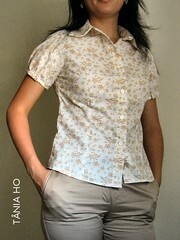 I didn't think I'd have enough time to make the blouse project, so I kinda gave up on making the deadline. So there I was last night, sitting in front of the teevee and thinking I would knit, and something suddenly possessed me to bring out the machine and whip out Simplicity 4589. I bought this pattern precisely because I've seen so many of you make it, and I've loved every single one. I've also been inspired by all the recycling I see everyone doing, from vintage fabric to old duvet covers, so I decided to use this silk that I scavenged from a Goodwill scarf. I was thinking when I bought it that it would make a cool purse lining, but I'm glad I decided to let it see the light of day. It wasn't as easy-peasy as I wanted (for one thing, I didn't buy enough black cotton sateen for the facings, but that was my own dumb fault), but I do love the finished product! It's perfect for a hot Texas day like today, floating about my body and disguising my muffin-top. finished this last night, just in time for the deadline .. 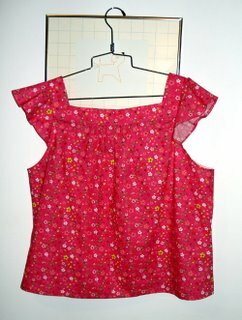 I had planned to sew another top like these, but when I saw this shirt pattern I knew it would be perfect for this cream cherry blossom fabric. It's from the magazine Patrones #245. Here is my shirt! It's Butterick B4395. I can't wear it just yet, but after I loose a few pounds it'll be waiting for me! I actually started it this morning and finished it in around 4 hours. The fabric is from Jo-anns. The exact name escapes me. If you'd like to see more you can visit my blog post here. Love seeing what everyone else is doing and can't wait for the next project! Well here it is, it needs to be washed before I can really bond with it. It will be perfect for the lovely sunny weather promised over the coming weeks here in UK. I would use this pattern again, but will use the next size down if I do. I've made a lot of recon tops lately, and here's a picture finally! It's a Vogue pattern, one of Sandra Betzina's new fit ones. The fabric and embroidery detail come from an unflattering full-length brown linen surplice sleeveless shift dress. Buttons from Grammy's button jar I inherited. 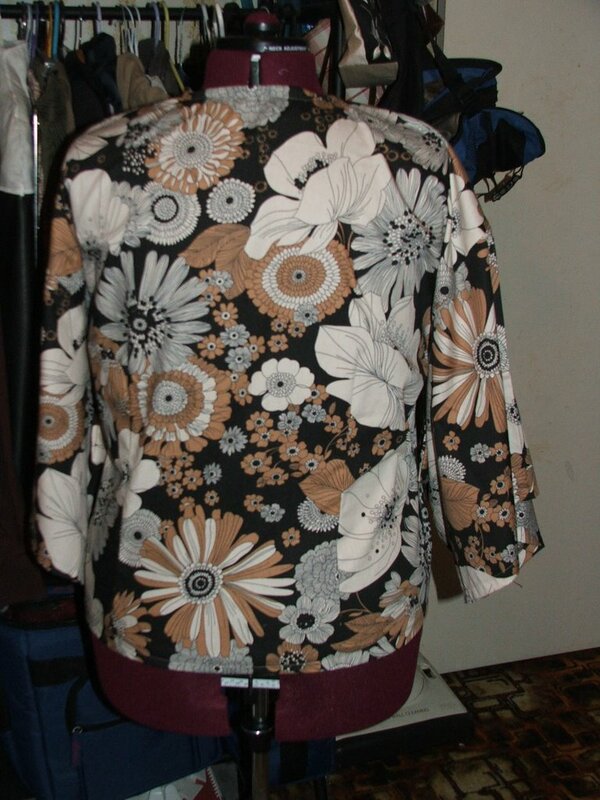 This one is Butterick 4789, made with 1 yard of knit fabric. This isn't one of my better efforts. 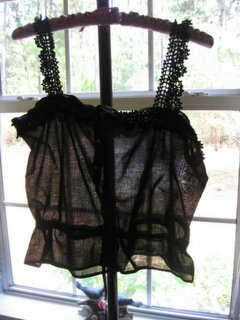 Although I like the finished top, there's a lot of sloppy sewing (mostly on the inside, so it's not visible in the photo). The pattern is easy, but I'm not that good at working with stretch knit fabric. The only modification I made was to shorten the length - the pattern is tunic-style and I chopped about 3 1/2" off the bottom. I think this one might actually be the same pattern as Nickie's - it's McCall's 4304. I used 2 yards of a light cotton print. 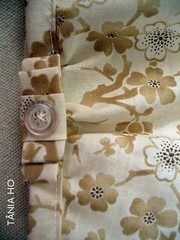 My mods: I didn't use interfacing and I used grosgrain ribbon instead of a fabric tie. This one is much better sewn - I'm quite proud of how nice it looks inside and out. I find that I need to wear a camisole underneath, however, since the front opening tends to show some skin. I look forward to seeing the rest of the tops come in this week... everyone else's are lovely. I've been lagging behind on getting this project done. Since school's been out, I've done nothing but keep the tires on my minivan hot! 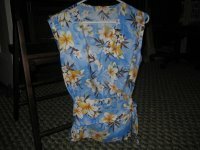 But, this week it rained and I was able to get some sewing done instead of live at the city pool with my kids! 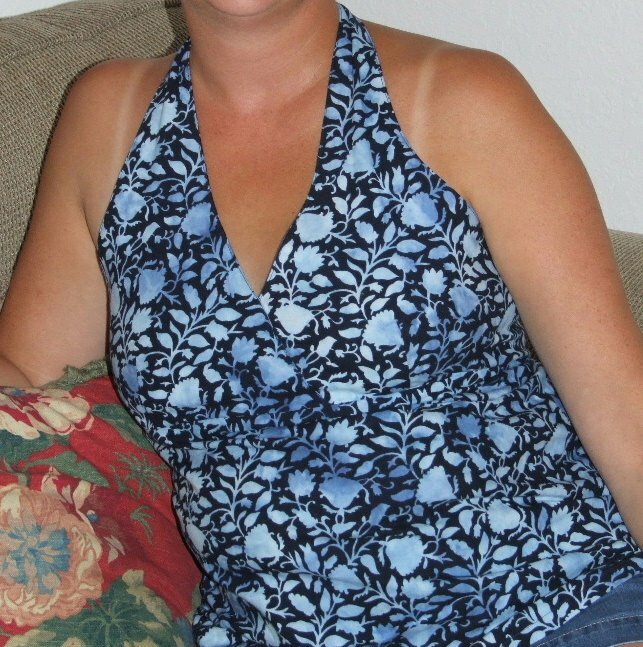 I made the Amy Butler Cabo Halter and I guess I like the way it turned out, but I don't really like the ties behind my neck, so I probably won't make it in the halter style again. I may try to make it into a cute tank/cami like some of the others here did, but I'd also have to make some alterations to get it to fit properly. I ended up sewing the front overlap together, because I didn't like the way it gaped. I've gotten a few compliments on it, and my husband likes it, so I'm sure I'll wear it a bit this summer. Hope everyone else is having a productive week! 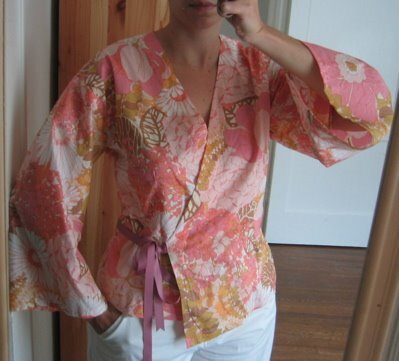 Here is my blouse for this session's sewalong. The pattern is up in the sewing room and I have forgotten the number. I believe it is a McCall's pattern. The fabric is a Westminster pattern from Victoria Wells. 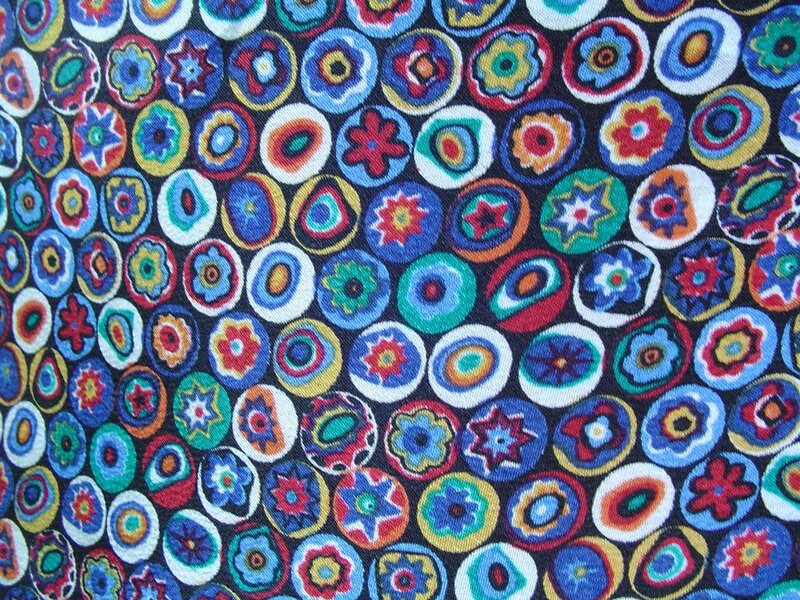 If you like Kaffe Fassett fabrics you will know this one. 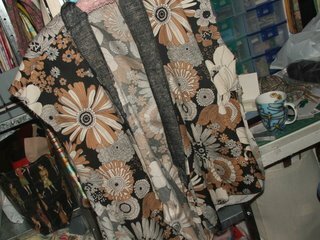 I thought it was rather kimonoish and I like the way it worked up in this pattern which has a kimono feel to it. 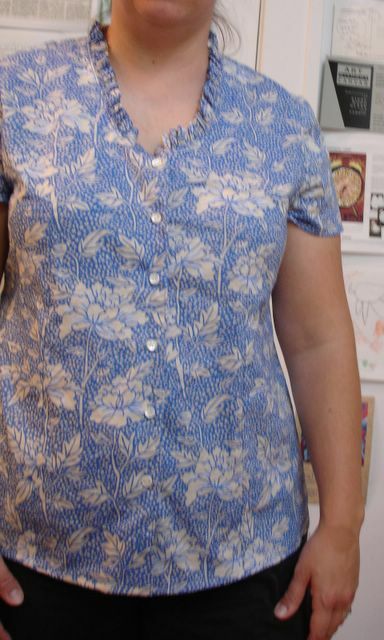 There are a couple of places in the instructions where I got a bit confused as to what they were refering to...the border strip being refered to as a facing caught me up short and I wasn't real happy with the way it was attached to the blouse front pieces. I had to do a bit of hand stitching here. cut them. There is one long piece and then a shorter piece. Be sure and cut the long one the full length of the pattern piece and the shorter one the next shortest measurement. I had to make them over again. Because I like finished edges and I don't have a serger, I finished the edges of the sleeves with bias tape. this also gave the sleeve a bit of crispness that I like. The interior edges I flat-felled where I could. The side edges I turned under and stitched down. 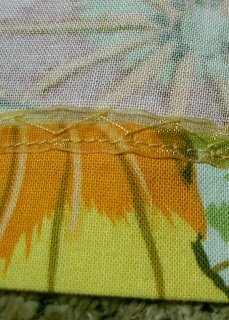 On the hems, I used a length of organdy ribbon that I had that matched and tacked down the hem with a hem stitch that I learned in college. It is pretty, lies flat and barely shows on the front. 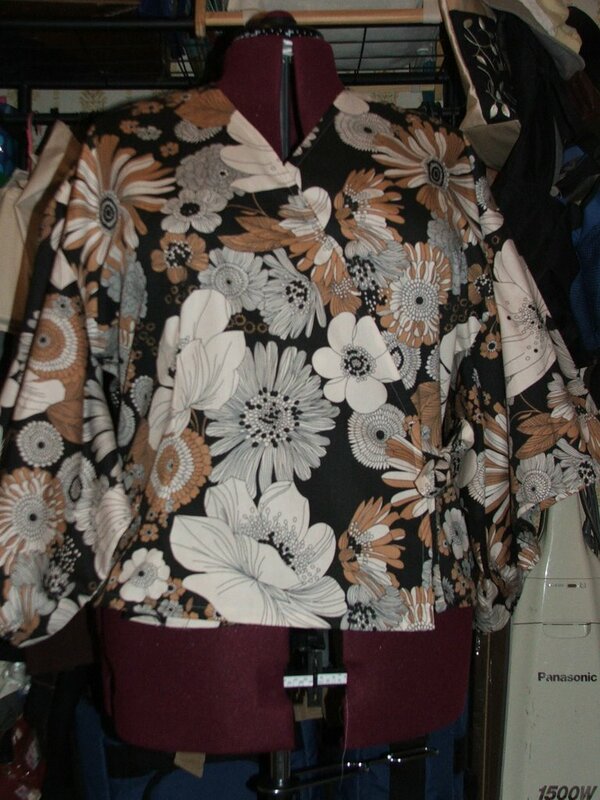 This blouse could use a little shoulder pad but I really like the way it looks. 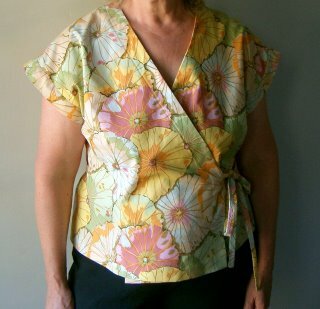 A bit different, nice and cool on hot days and not baggy or unflattering. Quilting fabric is lovely and soft and easy to work with. For those that haven't finished their top yet (this includes myself), there are less than two weeks til the deadline (10 days to be exact). So get those scissors working and those machines running. We will be announcing the next project on the 15th as well! 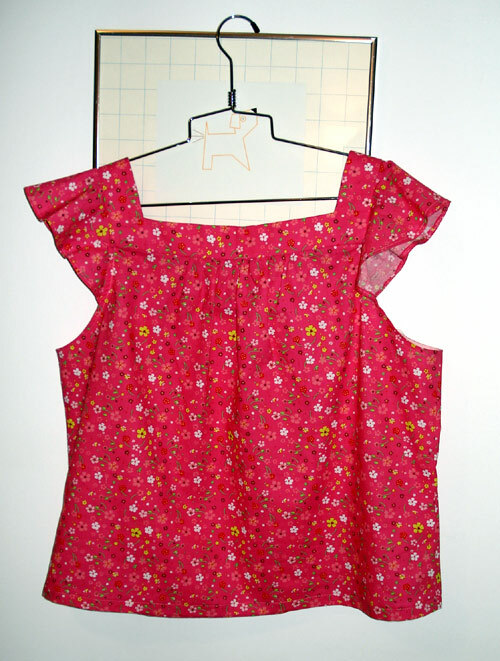 I made this camisole from Folkwear Pattern. I hand crocheted the edging and straps and used some antique buttons I had picked up at a bead show. I think I will make some more of these. It was very easy. It is basically a tube with some buttons, two draw strings, and some straps. The pattern is very versatile too. I'd like to have quite a few of these to wear under blazers, to sleep in, to the beach, and as evening wear. For all in tents and porpoises this top is done! I am not happy with the way it gapes in the front. Next time I have to remember to allow for my ampleness. Next step, when i get back from camping world, is to put a bit of lace in the V-neck. Without cutting out this top took about 5 hours to make. Pretty fast sew. I even fully lined the top part which they did not call for. Next post I'll have it on and be modestly covered! This was a quick and easy pattern. My only problem was that the sizing was too big. There was way too much ease for my taste so I took in each side roughly an inch. Note to self: don't just look at the bust size, also look at the finished size! 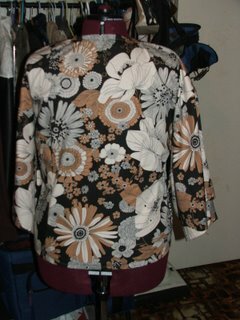 I have the pattern and fabric for another shirt, but I don't know if I will get to it before the deadline. I finished my second bag, an Amy Butler In Town Handbag, after the last deadline, if you'd like to see it, click here. Everyone's tops are looking great! It's McCalls 3940, a maternity pattern, I'm starting early to build my wardrobe for when we're ready to have number 2, I got very depressed over lack of maternity wear last time around. 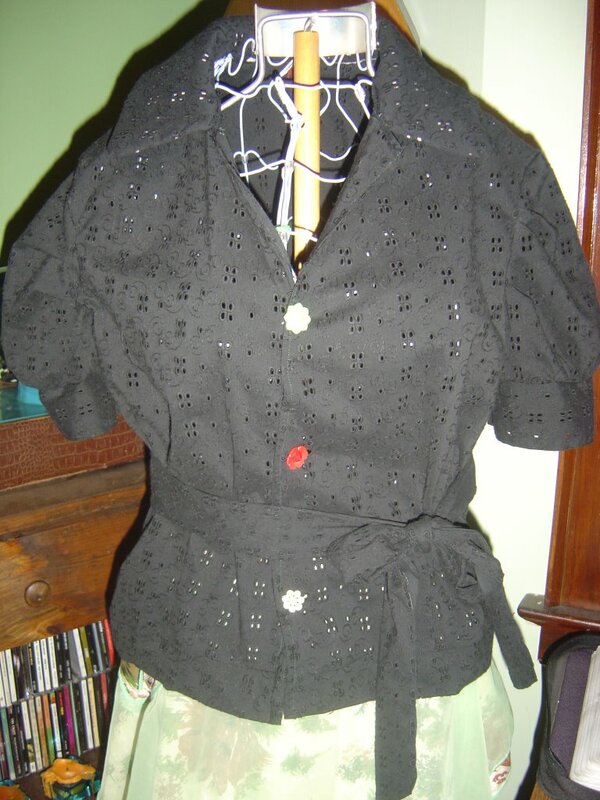 Simplicity 4583. As too large the previous shirt is this one is too small. I actually expected it to be a bit tight (I'm loosing weight at present so went down a size in hope) but not as tight as it came out, I will be putting it in the bag with the other things I'm working towards fitting into and looking forward to wearing it sometime soon! I am very happy with the way it turned out though, the fabric is Fair Trade organic cotton.